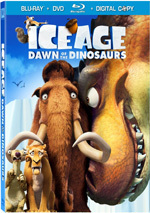 From 2002 through 2012, the Ice Age franchise offered a model of box office consistency. 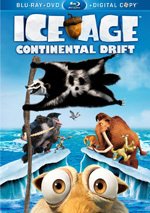 In the US, each of the four movies made between $161 million and $196 million, a streak that ended with 2016’s Ice Age: Collision Course. Boy, did that run die! Collision Course mustered a mere $63 million in the US, a figure that meant it earned almost $100 million less than the previous weakest entry in the series. Foreign receipts did much better and made the film profitable, but even there, Collision Course demonstrated a serious decline. The 2016 project’s $405 million worldwide marked a massive drop from the $877 million grossed by 2012’s Continental Drift. Given that Collision Course did eventually make money, I wouldn’t call the franchise dead, but the fall in box office fortunes definitely puts an Ice Age 6 in question. Personally, I’ve never been a huge fan, as only 2009’s Dawn of the Dinosaurs really entertained me. Still, I was curious to see if Collision Course gave us anything new. As always, rodent Scrat (voiced by Chris Wedge) protects his precious acorn, and this pursuit sends him into outer space when he discovers an abandoned alien ship. Due to Scrat’s misdeeds, he collides with asteroids that head toward Earth. Back on that planet, we reunite with original characters Manny the mammoth (Ray Romano), Diego the saber-toothed tiger (Denis Leary) and Sid the sloth (John Leguizamo) as well as their families and friends. When a few asteroids cause havoc, Buck the weasel (Simon Pegg) warns that a larger rock may cause an extinction level event, so all involved seek safety and survival. With all sorts of silliness and wacky hijinks along the way. I should be happy to see that Buck enjoys a prominent role in Course, as he became the breath of fresh air the series desperately needed by the time it got to Dawn. Buck does add a little enjoyment to Course - but just a tad, as even my favorite unhinged weasel can’t save the slow and tedious film. Actually, at this point, Buck feels like a crutch for the filmmakers, as he becomes Basil Exposition most of the time. His antics still provoke a few mild laughs, but he lacks a lot of purpose or meaning here. Not that anything else about the movie catches fire, though. Has there ever been a story about the end of the world that seemed less urgent or exciting? Probably, but Course still feels oddly dull and free from drama given the nature of its plot. Some of this comes from the fact we just don’t really care about the characters. Even across five films, Manny, Diego, Sid and the rest never managed to become especially interesting personalities, and the series fails to give audiences real reason to invest in their fates. Course also can’t bring any heft or seriousness to the events. One could argue that we don't worry about the characters because we know they won’t die, but that doesn’t hold water. When I watched Toy Story 3, my brain told me that Woody and pals would survive their brush with death, but my emotions still made me anxious and sad. No one will risk similar feelings during the drama-free Course - and it also seems unlikely much laughter will result. Though the movie tries desperately to throw humor at us, these gags almost always come across as uninspired. 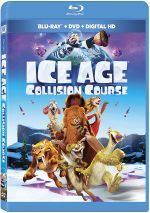 Is Collision Course the weakest Ice Age movie? Probably, but other than Dawn of the Dinosaurs, none of the others did much to distinguish themselves, so it’s an open debate. Course fails to bring anything new to the franchise and ends up as a wholly forgettable animated adventure. Footnote: a minor bonus sequence shows up in the middle of the end credits. No signs of softness ever emerged here. Instead, the movie always offered crisp, detailed visuals. I saw no shimmering or jaggies, and both edge haloes and print flaws failed to appear. Colors offered a good array of hues. Even given the movie’s icy background, plenty of situations and characters allowed for brighter tones, and those consistently looked vivid and rich. Blacks seemed tight and deep, while shadows were smooth and clear. This became a top-notch visual presentation. Almost as good, the DTS-HD MA 7.1 soundtrack of Course added a lot of pep to the material. With all sorts of action on display, the various channels contributed exciting information of a frequent basis. The many flying elements zoomed around the room, and general mayhem created a good sense of the settings. These filled out the spectrum in an inventive and involving manner. Audio quality was fine. Music sounded clear and smooth, while effects showed good range and punch, with very nice low end. In addition, speech appeared natural and distinctive. I found myself impressed with this strong soundtrack. As we shift to extras, we get a mix of materials. Called Ice Age: The Story So Far, a 13-minute, 15-second reel catches us up with the first four movies. This offers a commentary-free compilation of scenes that cover the events of those flicks. Most fans won’t need this tutorial, but I do find it interesting to see how much computer animation has evolved since 2002. The franchise’s beloved rodent character leads the next few components. Scrat: Spaced Out brings us a 14-minute, 42-second compilation that gathers all of Collision Course’s Scrat scenes in one place. A few unique elements appear along the way, and those add some value to the short. More rodent-based material shows up with Scratasia: Scrat’s Solo Adventures. This goes four minutes, 13 seconds – and just gives us a montage of Scrat moments across the various movies. It lacks much merit. Under Mysteries of the Scratazons, we find a five-minute, 13-second clip. It offers notes from directors Galen Chu and Mike Thurmeier and producer Lori Forte. “Mysteries” looks at the “Scratazons”, evolved female versions of Scrat. The show’s pseudo-serious tone feels a little silly, but at least we get more character background for the creatures who appear briefly in “Spaced Out”. Next comes Star Signs of the Animal Kingdom. It lasts four minutes, 42 seconds and refers to movie characters as inspirations for constellations. Some cuteness results but nothing memorable. With The Science of It All, we locate a nine-minute, 18-second reel with astrophysicist Neil deGrasse Tyson. He looks at the movie’s antics and discusses the reality behind all of it. Tyson is in serious danger of media overexposure, but he still makes this a fun look at facts behind the silliness. For a Sing-Along, we find a one-minute, 47-second clip that presents Buck’s version of “Figaro” It just takes the movie scene and adds some large text on screen. It’s an ad – and a waste of time. The disc also presents a Gallery. It presents 12 images of concept art. While I like the material, I’d prefer more than just a dozen stills. The disc opens with ads for Trolls and The Book of Life. Sneak Peek adds promos for Nine Lives, Epic, Rio 2 and Strawberry Shortcake: Berry Bake Shop. We also locate the trailer for Course. A second disc presents a DVD copy of Course. It includes the same extras as the Blu-ray. 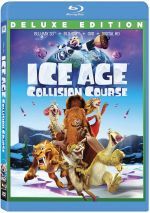 Should one expect anything new and fresh from Ice Age: Collision Course? No – the franchise’s fifth entry feels stale and lacks much entertainment value. The Blu-ray boasts excellent picture and audio as well as average supplements. Even by the series’ modest standards, Collision Course offers a dud.